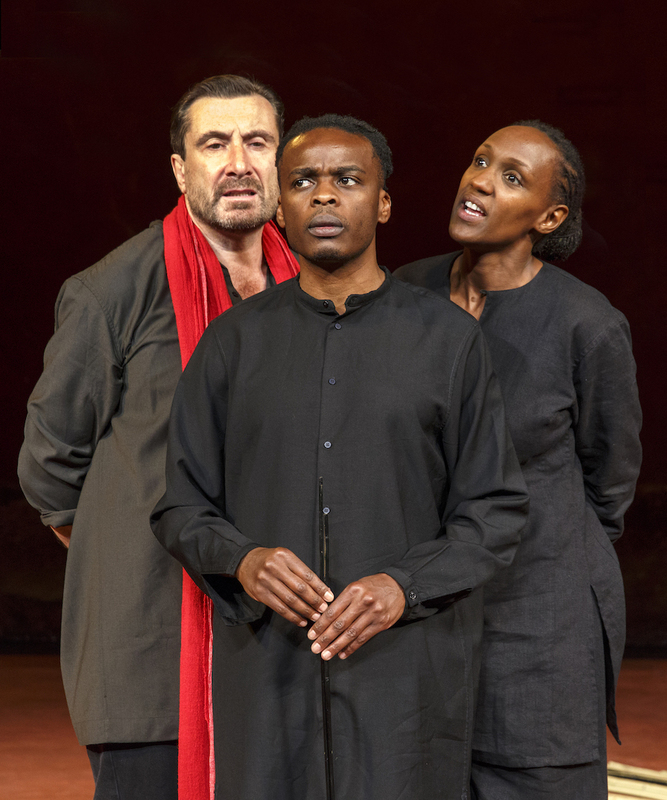 The sound of silence is one that’s rarely heard in the theatre, but under Peter Brook’s direction, it resonates like a clarion, loud and clear, echoing long after you leave the performance. This world-famous master of theatre arts has returned to the Brooklyn Academy of Music’s Harvey Theatre with Battlefield, a profound meditation on war and its aftermath. Battlefield is a seventy-minute distillation of the Mahabarata, Brook’s masterpiece that played almost 30 years ago at the Harvey (renovated expressly for that work.) The legendary production was based on an ancient Sanskrit epic poem, depicting the events of the Kurukshetra War, fought millennia ago. It was a massive effort, featuring 42 actors and lasting nine hours. Now, at 91, he and his collaborator, Marie-Hélène Estienne, have distilled it into a hushed, seventy-minute ritual of story-telling and theatre allegory – one that resonates profoundly in our own war-torn times. Battlefield bears the signature of Brook’s later work – a small ensemble enacting a story in an empty space (the phrase Brook coined in his eponymous 1964 study). The stage is strewn with a few, minimal props here and there – piles of sticks (which become a funeral pyre at one point), several large pieces of cloth in brilliant hues of red, blue, and orange that serve a variety of functions. The floor is covered with a red carpeting, which, along with the red, peeling walls of the theatre, envelope this story in the appropriate color of blood. As enacted by four players (and accompanied by a solo drummer, Toshi Tsuchitori), Battlefield tells of the aftermath of a devastating civil war, when the new king Yudishtira (Jared McNeill) must try to find a way to preside over his traumatized nation. His opponent (and his cousin), the blind king Dritarashtra, has lost one hundred sons in the battle, while Yudishtira has lost his own, too. “This victory is a defeat,” Yudishtira realizes. How can he rule his kingdom with all that blood on his hands, he agonizes? “Justice is the duty of a king and the price is very high,” he says, as he struggles to find a way to rule justly. 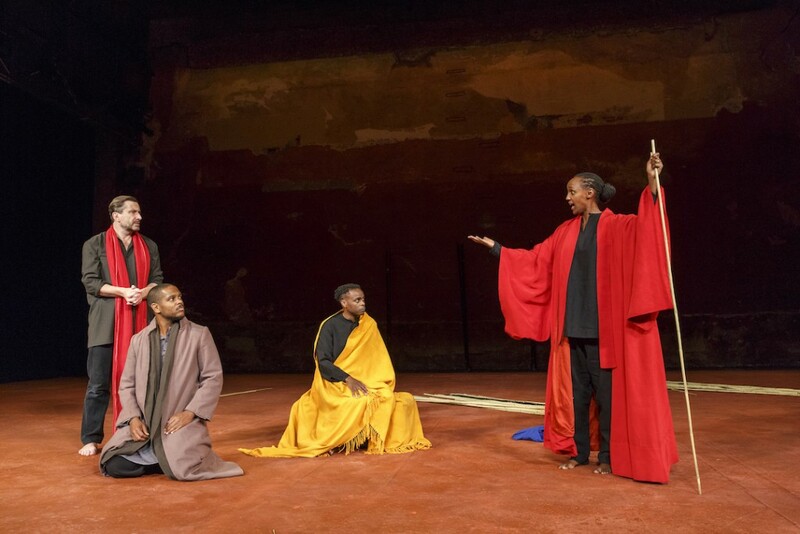 The miracle of Peter Brook’s story-telling lies in its exquisite economy and simplicity. The narrative conjures up images of battlefields strewn with endless piles of dismembered corpses, devoured by carnivorous birds of prey, jackals, and vampires. It speaks of the insatiable appetites of warriors and scores of weeping women. Yet no projections are needed – only the power and clarity of the words. 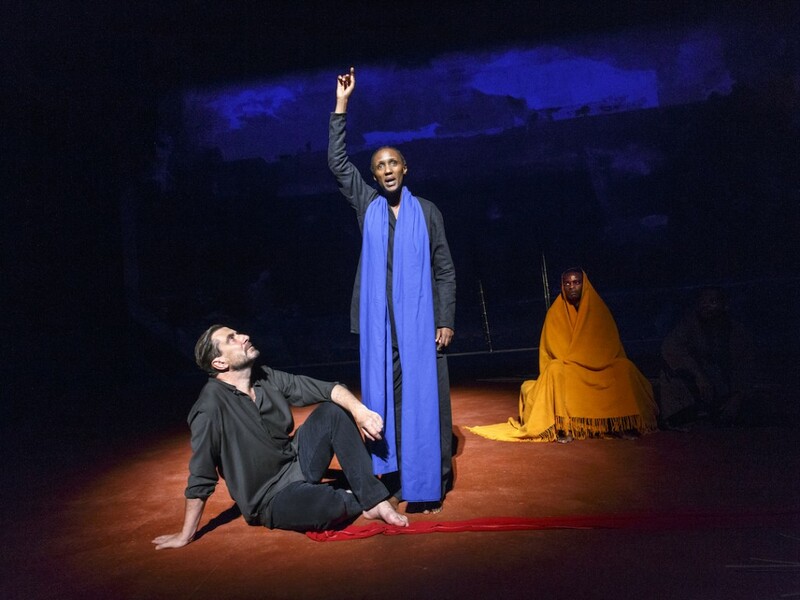 As Yudishtira struggles to face his destiny – how to rule after this apocalypse – he is enlightened by a series of parables told by his fellow actors (Sean O’Callaghan, Carole Karemera, and Ery Nzaramba) playing a number of roles. There are allegories of pigeons and worms, of dead children emerging from a river and returning to it again. These ancient stories are enacted by these barefoot players with a few colored robes that become a river, then a shroud, then a golden garment, and so on. It’s what theorist Brook calls “holy theatre – or the invisible made visible”. “The real sacrifice is in the heart, not in the law,” the new king learns. At one humorous point, the actor playing the king breaks the fourth wall and tries to distribute his wealth to audience members. “Is it true that the world will be destroyed?” asks one character. “It has happened already, and will happen again and again and again,” answers another. These profound insights into life, death, time and civilization –given in a spare seventy minutes – conclude with a profound, prolonged moment of silence, while a stunned audience takes in their meaning. Employing myth, ritual and symbol – the three essential classical ingredients of theatre – Brook and his collaborators tells a story for our times. Ultimately, Yudishtira realizes that winning a battle is not the end of a war, but the beginning of another one. With Syria, Iraq and Afghanistan’s blood on our own hands, what story could resonate more clearly?